where Japanese comfort foods and specialties, are served mainly as small plates to share. ‘ Namba’ is a district of Osaka, Japan, known for its dense and diverse profusion of shopping, entertainment and dining venues. And it is within these streets where Izakayas and its dining style, are best and most richly exemplified. a bounty of flavors, textures and colors, created to pique and satisfy your palate. 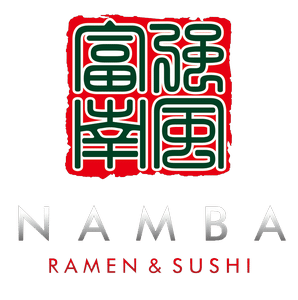 and continues to offer his signature fare that Naples has so enthusiastically embraced – Ramen, Sushi & Grill. NAMBA’s Ramen is served as a Personal Size portion, along with savory custom toppings of choice. Aburi Sushi also takes a spotlight – a style of nigiri sushi, where the raw (shell) fish is partially grilled topside. Premium Grill Selections include mouthwatering Prime Rib Eye, Alaskan King Crab and Whole Tiger Prawn. Chef Koko continues to showcase Japanese cuisine to Naples, with innovative flair. relaxing and socializing with friends and family. Copyright © 2019 Nambanaples. All Rights Reserved.